With cost of operations rising across all industries, we understand the pain fellow business owners are experiencing. It’s times like these when government grants and partnerships become extremely helpful. In a bid to help local businesses survive in what has been reported to be the most expensive city, we have introduced a new scheme that allows company-wide free calls*. From now on, all call forwarding and outgoing calls from one Hoiio number to another is free-of-charge. 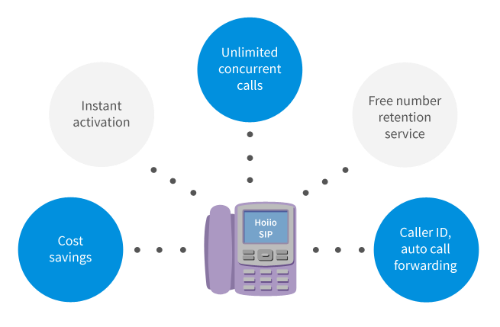 This means that when you adopt Hoiio’s SIP Trunk, automated attendant solution (Main Line) and office line (Direct Line) for your company phone system, you don’t need to pay a single cent. This should be good news for companies that do not have a PBX system or do not intend to set one up due to various technical or economic reasons. At just $10/month, you can purchase a SIP line for each IP-PBX phone. And if you have offices in Singapore, Malaysia and Hong Kong, you will get to save on expensive IDD call charges. Once you switch over to Hoiio, you will no longer pay for calls within your company. In fact, the more lines you get, the more money you will save considering the value-added services you will be receiving. Caller ID and Auto Call Forwarding services will come at no extra charge. Did we also mention that there is no limit on the number of concurrent calls you can make? By activating SpiderGate on your Hoiio SIP line, you get Do Not Call (DNC) barring services on your IP-PBX phones. There is no need to do manual DNC scrubbing as all calls made to numbers registered in the national DNC registry and company blacklist will be blocked. Most importantly, no one should be denied of better service. For every line you subscribe to, you get it activated right away. *Free calls applies only to Singapore, Malaysia and Hong Kong phone lines.